A piece of boxing history will be made this summer, as we will see, for the first ever time, one fighter hold all four recognised world cruiserweight titles simultaneously. The winner of the grand final of The World Boxing Super Series, be it Oleksandr Usyk or Murat Gassiev, will hold the distinction. Back in Evander Holyfield’s day it was a little easier to become undisputed cruiserweight king, simply because there were only three universally recognised world titles, at any weight: WBC/WBA/IBF. And, on this day 30 long years ago, with no WBO sanctioning body anywhere to be seen, “The Real Deal” lived up to his nickname (although more greatness, greater greatness if you like, awaited Evander, up at heavyweight) by cleaning up his weight class. On April 9, 1988 in Las Vegas, a 17-0 Holyfield met a 44-4 Carlos De Leon in a 190 pound unification showdown. Holyfield, aged 25 and the holder of the WBA and IBF titles, met the 28 year old Puerto Rican who held the WBC crown. De Leon had actually made some boxing history of his own when, in July of 1983, he avenged a shock stoppage loss to S.T Gordon to become the first-ever two-time world cruiserweight champ. Despite this and his vast experience (De Leon would become champ again after losing to Holyfield) De Leon was no match for the warrior from Atlanta. After a one-sided fight that saw Holyfield punish De Leon over eight rounds but fail to put him down, the 1984 Olympian had, in less than three-and-a-half years after making his pro debut, also become the lineal world ruler. Still, Holyfield’s big accomplishment was overshadowed by something and someone bigger; namely the world heavyweight title and the man who currently owned it: Mike Tyson. These two had met as amateurs (history now tells us how Holyfield had the better of things, and always was anything but intimidated by Tyson) and would, some eight years on from the De Leon fight, meet again (and we all know what happened, twice). But at the time, there was underway from fans, experts, historians – everyone – a search for a fighter who was capable of testing Tyson, let alone beating the primed and peaking heavyweight king. 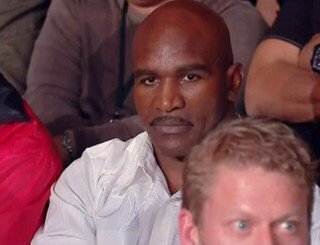 Holyfield was, in the opinion of some, but far from all, the man for the job. Holyfield had barely raised his arms in triumph after despatching De Leon inside eight one-sided rounds, before talk returned to his chances of being successful up at heavyweight and of giving “Iron Mike” a real fight (hardly anyone felt Holyfield would actually be able to beat Tyson, much less take him out). Evander’s move north was very much on and, just three months later, Holyfield would indeed invade the heavyweight division. “The Real Deal” was all but untouchable as a cruiserweight, while up at heavyweight, having a height, weight and reach disadvantage against just about every man he faced, Holyfield had things much tougher. It was here though that Holyfield showed the world how very special a fighter he really was. Simply put: Evander ducked no-one, at cruiserweight or at heavyweight.